Buffalo wings and football go together like cake and birthday parties. So chances are, if you’re not vegetarian, you’re going to be eating some wings with your beer during this Sunday’s Super Bowl. It would be wrong not to! However, it couldn’t hurt to shake things up by adding this twist-on-a-classic to your playbook. These chicken wings spiked with ground ginger will score a touchdown with your guests and cause your taste buds to get a little rowdy! The basics of this recipe were shared with me by Anthony Prontelli, Executive Chef at Rock Center Cafe, in Rockefeller Center. I gave it a makeover to eliminate any preservatives, cane sugar, or refined flour. Anthony was an enormous help; I’m new to writing recipes, and I had soooo many questions for overhauling this recipe to make it “all-natural,” successful, and scaled down from restaurant-size batches and measurements. I had a hard time finding ingredients to substitute the combination of Sambal chili paste, sweet chili sauce, and Tabasco used in the original wing sauce recipe. I decided to go with a pre-made BBQ sauce. It was a challenge to find an all-natural sauce without sugar or canola oil. I only found two that met my specifications–one was more sweet than hot, so I chose the hot one, Bone Suckin’ Sauce (Hot). It uses honey and molasses as sweeteners and has no oil. I thought it might be too hot for some tastes (my husband can’t handle spicy) but the butter cuts the spice down to a mild heat. The ginger adds some heat back, but my husband was fine with it. If he can handle it, most anyone can! Of course, if you want it really spicy, feel free to add hot sauce until you reach your desired level of heat. A word on the flour. I was going to use whole wheat flour, but didn’t have any on hand. I did, however, have brown rice flour and coconut flour and wanted to see how an alternative flour would work. I decided to go with the the rice flour since coconut flour is pricy and I needed several cups. If you use a gluten-free flour like I did, you’ll have to soak the chicken in milk for 15 minutes so the dry ingredients will stick. The chicken browned nicely using the rice flour, but the coating wasn’t as thick as I would have liked and came off in areas. It would be easier to just use whole wheat flour if you have no problems with wheat, so you can skip the hassle. This recipe yields 2 cups sauce, enough to cover 50 wings, but you can adjust the recipe to suit your needs. To save time on the day of cooking, fry the wings to a golden crisp beforehand and then bake the rest of the way when needed. For flour: Mix all ingredients in a large bowl. Dredge chicken in the flour until coated, shaking off any excess. Preheat oven to 350°F. Fry chicken wings and drummettes in oil until golden brown and crispy. Keep in mind the smoke point of the oil you’re using. I recommend doing them in 2-3 batches to prevent the oil from getting too clogged with flour, which will cause the oil to break down. Transfer fried chicken to baking dishes or sheets. Bake for 7-10 minutes or until fully cooked. Make sauce while chicken is baking. Either lay wings on paper towels to soak up any excess fat or drain them on a wire rack. For sauce: Melt butter and pour into a blender. Add ginger and blend briefly to dissolve ginger as much as possible into butter. Add BBQ sauce and apple cider vinegar. Blend until smooth. 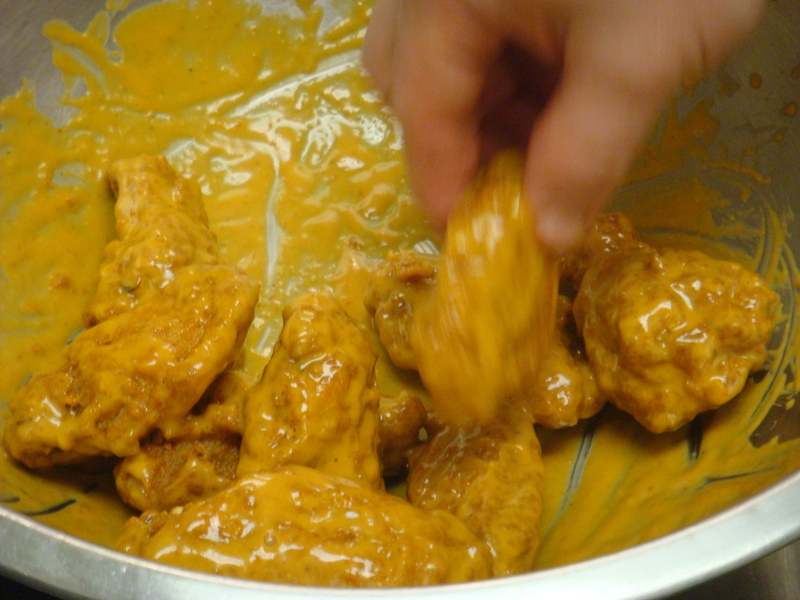 In batches, place chicken wings in an oversize bowl, pour in some sauce, and gently toss to completely coat the wings. Serve with celery, carrots, and blue cheese dressing. And don’t forget tons of napkins too! Thanks for stopping by! I appreciate the correction Shirley, took out that sentence.